All bulk orders are baked fresh for your particular order. Note: Orders submitted on Shabbat, the weekend and holidays will be processed promptly on the next business day. Bulk cookies are packed 300 per box. Gift Pails contain 8 cookies and are packed 12 Gift Pails to a case. Some breakage may occur on bulk shipments. Our price allows for up to 4% breakage on bulk shipments. Gift Pails display the Star-K symbol on its package label. 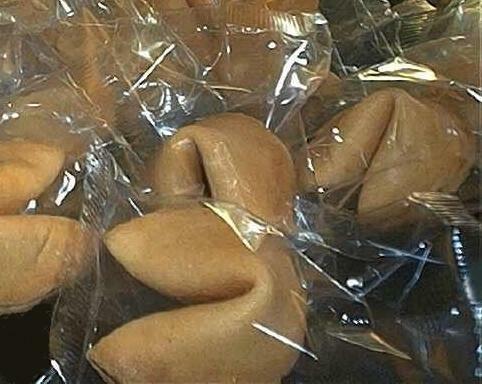 (For Bulk purchases only) Bulk fortune cookies are individually wrapped in clear cellophane with no markings on the cellophane wrapper. Click here for image. If you are ordering Bulk Fortune Cookies and need a copy of the kosher certificate, please check the box below. Please include a copy of the Kosher Certificate for this product. Bleached wheat flour, water, sugar, margarine (liquid & partially hydrogenated soybean oil, water, salt, lecithin, mono & diglycerides, sodium benzoate added as a preservative, artificially colored & flavored, vitamin A Palmitrate), natural & artificial flavor, baking soda, Yellow 5 & 6. All orders are shipped by standard UPS Ground service and billed to your order. You will be charged for actual shipping cost. Estimated shipping cost per 300 bulk cookies is usually between $16.50 - $21.50 depending on location. Added to each order. Based on the state tax rate of the Delivery Address.